Most of the people especially the tourists call it Molivos and a few of the people who reside here call it by its old classical name Mithymna. According to Greek mythology, the first king in the islands history was Makara who married his daughter "Mithymna" to the Thessalian prince "Lesvos" from which the island also got its name. During the Middle Ages the Turks who took over the island in 1462 called it Molivos. It is said that because of the metal "lead" found in the rocks of the sea or because of their "lead" color it got its name. Lead in Greek is "molivi." 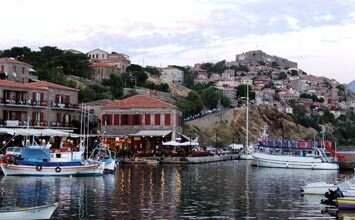 Lesvos considered the island of the Muses is the third largest island and located in the northeastern Aegean Sea. 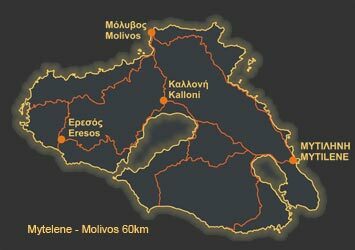 Molivos sits on a headland in the northwest of the island, sixty-one kilometers from the capital Mitilini. 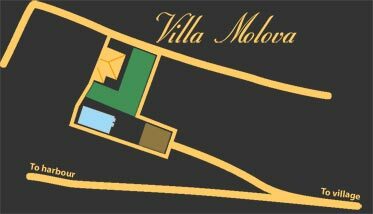 The first thing you see as you enter Molivos is its medieval castle built by the Byzantines and renovated by Francesco Gattelusis when in 1355 Lesvos was given as a dowry to the Genoese prince by the Byzantine emperor John Paliologos for marrying his sister Maria. The castle is four hundred feet above sea level and dominates the town built of red tiled roof stone houses, which drop away down the steep sides of the hill below to the sea. Most of the houses are two storied and resemble northern Italian architecture. A labyrinth of narrow cobblestone streets, many overhung with wisteria lead up through the Agora and down to the harbor where colorful fishing boats nestle alongside the open-air taverns. In 1965 the authorities passed a law protecting and preserving the village as a historical landmark since it is the most picturesque village on the island, which I'm sure you will agree once you, arrive here. Castle, archaeological sites, churches, local culture festivals, water sports, scuba diving, swimming, snorkeling, boat trips, donkey trekking, tennis, biking, walking, natural thermal baths, massage, beaches, taverns, restaurants, cafe- bars, car rentals, bank, shops, port harbor. Lesvos Petrified Forest, Museum of Works by Theophilos, Archaeological Museum of Mytilene, Teriade Museum - Library, Archaeological - Folklore Collection of Napi , Museum of Industrial Olive Oil Production, bird watching.